In the 1940s, Batman protected the state of California. Seriously. Sure, it may not have been the vigilante Yale graduate we've all come to know and love, but a Batman (and his squadron of Bat-Men) did join the California State Guard for a blip in history. 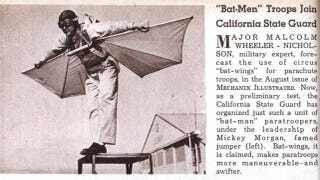 Pictured here in this Mechanix Illustrated article from January 1942 is Mickey Morgan, who made his career testing awesome wingsuits. Where did Batman go to college? What makes this news tidbit all the more hilarious is that the military forecaster mentioned in the article — Major Malcolm Wheeler-Nicholson — founded National Allied Publications, the predecessor to DC Comics. Heck, Major Wheeler-Nicholson even helmed the creation of Detective Comics. In case you're wondering if this was just a ploy to surreptitiously shill Batman comics in an engineering magazine, know that Wheeler-Nicholson left the company before The Bat-Man debuted in 1939's Detective Comics #27. Nonetheless, I love how reality momentarily mirrored Gotham City's newfangled crime-fighter. It's Batman Incorporated, old-school!